From the second quarter of 2015, Christchurch bus users will enjoy a state-of-the-art Bus Interchange in the heart of the city. Bounded by Tuam, Colombo and Lichfield streets and SOL Square, it has been designed to meet the needs of customers – both now and in the future – and to integrate with its urban location and the existing public transport network. On opening, the Bus Interchange will handle up to 115 bus movements per hour and by 2041 it will be used by about 7,500 people per hour. It will cost $53 million and they also say it will include other development opportunities, provide easy access to the ‘slow core’ of the CBD that is being prioritised for pedestrians, includes cycle storage but also carparking (which is odd as they say the bus interchange is about trying to encourage PT use to get to the city. The interchange is being designed by Warren and Mahoney along with Aurecon but I can’t help be feeling that the design is focused too much on how the interchange looks and not how it will actually operate. And here’s the top down view. The design seems incredibly impractical for a bus interchange, it looks more like an intercity terminus. Here are some of the issues with it. Due to the internal roundabout it uses an incredible amount of space for what is only 16 platforms. Some island platforms could probably cut down the land requirement substantially which would have left more land available for development. Due to how deep the sawtooth platforms are, buses will need to be reversing quite far to be able to get on to roundabout. That presents two major problems. This design gets even stupider seeing as ECANs proposed bus network in their 2012 Regional Public Transport Plan has buses through routed through the CBD, not terminating in it. “The concept of discrete shops, laneways and open space is very much a winner with the Canterbury public” (Gerry it’s not just those in Canterbury who like that). Probably I should have expanded a bit more Matt. Same issue with the fact both are Saw Tooth designs – but the consequences and gravity of those consequences with Christchurch is as you said much worse owing to the deeper teeth in the design. Ben, the most likely reasons for preferring the sawtooth design for Christchurch is that ECan is replacing the old system of having the exchange as a simple bus stop for a whole lot of cross-town routes, which necessitated a maximum throughput design, to having it as a terminus for a small number of express routes in a hub-and-spoke system, which requires a lay-over space so each route can wait till it’s scheduled departure time, especially off-peak. It is also only half the cost of the underground exchange approved in 2009 for the site of the current temporary bus station. This is another early concept. Compared with what is being touted now, it places the passenger lounge in the centre like the old exchange did. The second design looks much more functional. Which after all, is what PT is supposed to be. Agree. Looks like no operational input at all. I was at the temporary station a week ago and that it was working perfectly fine the way it is designed. (Liner) I feel that the sawtooth layout will make things much slower than it is now. The practicalities of people trying to board buses while other buses are reversing seems like a recipe for disaster to me. With Brownlee’s involvement it gives me the feeling they are trying to discourage the use of public transport. Definitely not a facility I would want to be using on a regular basis. LOL, it must be an early April fools joke. The safety issues alone are enough to kill this design. Unfortunately that is the design that is likely to happen because the construction has to start in a few months so there won’t be time for the proposal to be revised. In fact I question whether there has even been any proper public consultation over it. There must be a design consultants report somewhere justifying the logic of this? “Ho hum, I will walk along 10 stops for 50+m – then squeeze between two buses (one of which is just disgorging passengers in my way), then peek around the end of bus to see I am not being hit, then hope that the first bus isn’t reversing, then get to the central island. Good thing there’s lawns there, because I am going to have to relax from the ordeal”. That central island, if there IS anything on it that’s worth walking to, will be walked-to from between all the bus stops, the zebra ignored, and for good reason. More likely result is that the central island will be useless space AND a safety risk remains. OK, a bit more detail might be needed to explain some of this (I was at a briefing/feedback session on this a month or so ago). The area in the middle I gather is only for staff (e.g. bus layover, service operations); Joe Public is not expected to go across here (I agree that the zebra xing location shown though is a bit dumb, but plenty of better places to locate it). In fact, Joe Public won’t be able to walk out into the bus area because it will be glass-walled off in the same way that the old Chch bus exchange was. You will only be able to access the bus doors and bike racks. So you won’t have pedestrians mingling with reversing buses. I’ve had some time to think about the operation of this layout, and I have no major issues with it. The extra space for proper manoeuvring will be a great improvement over the pre-quake Exchange where some buses couldn’t move until someone else had moved (and you weren’t allowed to take a bike on the front racks because it wouldn’t fit). The SW corner bus won’t block the entrance – there is a separate manoeuvre space for it. If you went to an island format I can’t see that it would greatly reduce the footprint, and if you still wanted to keep pedestrians separate from buses (which is a desired aim) that would have to be done via underpasses or overbridges (relatively inconvenient for many) – plus some suitable consideration for mobility access. Well Glen Koorey I wouldn’t expect a cycle advocate to necessarily have much knowledge of bus operations. Would you? And do you agree that calling in CAN constitutes sufficient public consultation, because CERA isn’t going to do any proper public consultation because they have to rush to get the construction under way. The island is a big wasted space and we didn’t have one in the old exchange because the space in the middle was the main passenger lounge. it was a much more efficient use of space. The time taken to reverse buses out of the bays is going to increase the time each bus will need to spend in the exchange which will slow down the throughput. It will be hard for drivers to back out inside the exchange with the limited visibility in mirrors and some of the buses are quite close together at the corner which is going to make it a lot harder to back without hitting another bus, plus they have to wait for buses going round or into slots to get out of the way. This is not a design for high throughput. My guess is the same number of platforms could have been achieved in two long linear platforms along the two Ls. Considering there were 9 platforms in the old exchange which is much smaller. Get rid of the island and there is plenty of room for buses to pull out. Or else the waiting room goes in the middle like in the old exchange. Anyway there are a lot better layout options possible. Wow, I’m not even sure how to respond to that first paragraph. It’s as if all my years of transportation/engineering training, research and teaching (including public transport) didn’t count for anything… CAN weren’t consulted on this BTW. Look, we could debate the various nuances of why they made the layout the way they did, but essentially I don’t see it as fatally flawed. Could they have made it more compact? Probably. But they were given a footprint to work with from CERA and used it as they have (I don’t think they have used all of it anyway; there’s surplus land to the east). You have seen it before anyone else who had to wait to see the diagrams last week, and that is the extent of consultation if that’s what you would call it. I have searched high and low and there is no information to be found anywhere on the design of this thing, any public consultation or anything about the bus route proposals that are supposed to work with it. Reversing is definitely the issue. They tested their layout outside, in broad daylight. A lot different from being inside in a dark tunnel (going by the tunnels in the previous exchange). A bus is a lot harder to back than a car, they are long, and the visibility inside is poor. The driver would be relying on their mirrors. A lot of the platforms are very close together, so they would make the visibility even more difficult. But the main problem with reversing is that it slows things down. No public will use the centre island, it is a service facility. Thanks guys for an informed article and intelligent debate about an important part of Christchurch’s PT system. When I saw this I thought it was another dumbass attempt at the Manukau Bus interchange. But no, its a dumbass attempt at a crappy bus station by someone whos got no PT knowledge or design experience.. I thought Warren and Mahoney could do decent designs, this one is obviously not from their design “A” team. Maybe its the “Gerry Brownlee Midnight Special” version? I recall photos of the old Christchurch “Tram terminus” in the Square before it was redeveloped in the early 70s to the present layout and while that old design was good for linear and straight through routing – it was a traffic/pedestrian nightmare due to the fact that general traffic could also use it too. Wouldn’t be a problem here as no self respecting car driver would go near this. But even so, a design from 70+ years ago – for trams FFS – beats this one – hands down. Back to the drawing board guys, Christchurch has been through enough from Mother Nature – it doesn’t deserve this man-made crappola as well. Putting aside any reservations about the sawtooth parking for a second or two, I’ve gotta say that I find the roof form extraordinary. Ok, yes, as a Wellingtonian I would be concerned about the shape of the roof funneling winds into the station. I know that Wellington is known as the windy city, but Canterbury has enormously strong nor-westers too, and as seen by last week’s storm, Christchurch is very susceptible to stormy weather. I’d love for WAM to join us here and discuss the concept of the roof a little further, and perhaps allay my fears that it wil end up being totally inappropriate? One answer could be, of course, to have a glazed wall between the buses and the passengers, with doors that open when the bus has arrived – I think that Brisbane station has a feature like that. As I said, there will be glazed walls between buses and passengers. And to be clear, the entire passenger area will be “indoors”. Ok, sorry, I missed that in your comment that there would be a glass wall between the people and the buses – and that’s good that it is there. I see now from the pictures that are shown here, there is a glass wall to keep the wind off the people using the Interchange – a lighter tone indicating a massive glazed wall spanning floor to the very high ceiling. Not quite how they will achieve that, but it’s early days. Any comment about the roof that’s all out of whack? I guess that is tring to be a folded structural plane giving self-support, so that it can span over the buses below. Still seems totally mad to me, catching the wind and funneling that nor wester straight down onto the heads of anyone trying to enter the building. Triumph of style over function? … why not a simple shade sail like there used to be over the Triangle Centre? … will the sawtooth platform allow exiting buses via both front and rear doors? It looks as if the desire to keep buses and pedestrians separate has been the overwhelming design factor here, effectively requiring a sawatooth design instead of the through-platform design at the current interchange. This means that the place will have quite limited capacity: assuming it takes 2 minutes to dive in, unload, load, back out, drive on, a 16-platform facility gives a maximum of 64 buses an hour, with plenty of potential for conflicting manoeuvres, and the associated two minutes extra time on the schedule of every bus going through the interchange. Compare this with the 5 platforms at Wellington Station’s bus interchange, which at the peak serve over 100 buses per hour, in each direction (in the northbound direction, at just one stop!). There are differences: many of Wellington’s services terminate northbound/start southbound, there is congestion, and passengers and buses are not separated – not that I’m not sure that’s ever been much of an issue in the 74 years such an interchange has been there – but the contrast in capacity is notable. .
I’m not sure where you get 64 buses/hr from 16 platforms; that’s one bus every 15 minutes per platform. If we assume that a bus could arrive unload/load and go in 5 minutes (easily done with current/previous Exchange arrangements) then we can treble that capacity. 5-10 secs of reversing out of a platform is hardly going to play havoc with those timetables. “Hub and Spoke” network is a crock, and it’s been challenged by the city council. All the buses should be going into town except for cross city routes. You really need to read “Human Transit” Helps you appreciate network design a lot more. That if you were to read this book, or probably even 2 chapters of it, it would explain to you exactly why this type of network is vastly better. Meaning that spouting “is a crock” and “I think it should be different” doesn’t count as an argument on here. You need to actually make a point or give reasons. See my long reply further down in the thread. Hubs are places you put 10 km or more out not 2-3 km out. The bus can travel that 2 km in 10 minutes. If you route is 5-6 km long why chop such a short route in half and put a mandatory transfer in the middle of it with the attended delay and inconvenience. Bus transport has to be able to compete with car transport, where people don’t want to get out of their cars in nasty weather. In Auckland and Wellington the hubs are at least 10 km out, and often a lot further, and that makes a lot more sense, you can have an express bus into town and make a meaningful time saving over that distance. If the hubs as implemented were such a great idea all the routes would be going through them, and they aren’t. They are only putting a few routes through that don’t serve many passengers. If a lot of people were being forced to transfer only 2-3 km from the city centre the level of complaints would be huge. The second point is that at such a close distance there isn’t justification for building another interchange with the same type of facilities as the central one, so there will be safety issues at night, or weather problems. I already pass through Eastgate at night and I won’t transfer there in darkness if I can help it. The only places in Christchurch which could justify a hub are Hornby and Kaiapoi. The city is not as spread out as Auckland or Wellington where the distances being covered are much greater. The last word to the Christchurch City Council which in opposing the change of routes said they did not want to spend money on a new and unproven transport model. Instead of radical change of the routes, Ecan should have been looking at why the routes carried such small numbers of passengers and how they could be improved to make them more relevant to where people want to travel. The old interchange had a layout with two separate lanes next to each other, not unlike the current temporary interchange. The crossing from one to the other could be made overhead on the second storey, or via the street entrances. That footprint you show of the new interchange doesn’t really square up with the shape of the plan shown above; it’s probably only 70% as wide. Also your old Bus Xchange footprint fails to show the Colombo Street platforms and the adjacent retail and lounge space between them. That’s all now included in the new interchange footprint, together with more retail. The shape drawn in the diagram is wrong. Here is the layout of the old bus exchange. Very different, but also very efficient. the design of the new one would imply it is a terminus rather than a simple interchange. Routes that terminated in the city centre used layovers on the outskirts of the city centre as well as passing through the bus exchange. If the new design is really for an interchange it is a very bad design. This looks quite rubbish compared to the old pre earthquake terminus. That thing was impressive. Efficient, high throughput and small footprint. …except at peak hour, when buses would queue out of the building waiting for a space. Nominally there were 15 spaces in the old Exchange (including the on-street platforms), although three (Platform A) were oddly never really used. And other buses couldn’t leave until the bus in front of them went – hardly efficient. It was built to take advantage of a property opportunity that came up, but it was cramped and even pre-quake demand had exceeded expectations and plans were being made to build a new one. yes they could pull out and pass and did. Buses were not stopped there very long, anyway, as it was not a terminus. Leaving operational issues aside (reversing buses never good) I’m loving the bold form. looks like form has taken precedence over function. Always a mistake: Inefficient operational performance will reduce patronage (and increase costs) and ultimately undermine the value of the interchange to both the community and the government agencies/bodies responsible for funding PT. Ideally we get both. And they certainly aren’t mutually exclusive. I’m also loving the bold form. One of the the things to me that makes bus transit impressive, is convenient, comfortable, efficient AND stylish stations between all those efficient busways and buslanes. The fundamental things that make buses so darn efficient, flexible, and low cost also tend to prevent them from being “style icons” in the way that a tram or a train can be. So – following a purely aesthetic argument, those bus terminals and stations do a very important role in enhancing social perception of bus travel. Brand building for buses if you like. Accepted though, that such a purely aesthetic argument is the icing on the cake – the fundamentals of correct location, correct objectives and correct functionality have to be sound…..which unfortunately might not be the situation here. I’ve seen some good sawtooth stations that work well as terminii, but there do appear to be some fatal movement flaws in this one – primary is a bay reversing directly into the restricted entrance of the whole complex. For comparison: link below to the sawtooth examples I know best: two side by side in Newcastle, UK. One was built with this same fatal flaw and is regularly stuffed up (where the green roofed bus is), one much later went out of its way to address this and other movement risks with this type of pattern, such as dealing with layover etc. The new one also had a glass concourse/airport gate style interface, feels good. The new Newcastle one also went out of its way to integrate into the surroundings (seventies megastructure planning that badly needed urban surgery), and I personally think this is a better philosophy for PT interchanges than object architecture. New lynn rail station is a good example: looks hot, but really awkward to move through and use for travellers. Sorry: if you follow the link, spin the view to look south. OK, lots of nice words but focus, W&M won’t have designed this without a brief, once again, there must be a design consultants report somewhere justifying the logic of this. Where is it? Yes, where is it and how can Transport Blog get hold of it? @tuktuk: By making a request under the Official Information Act, of course! Do it via this handy online service, so we can all see the outcome. The movie clip shows that passengers are physically segregated from the buses by glass screens, and that there will be no one trying to board at the centre “island”. Buses will drive forward into the sawtooth bays, and then back out. A key comment perhaps – ‘will reduce bus movements in the central core of the city’ and then ‘is being developed jointly by ECan, CCC, CERA, New Zealand Transport Agency and the private sector’. Aurecon are one of the private sector agencies, with quite a global and NZ presence. So, it seems to me that the architects brief was drawn up by one or more of ECan, CCC, CERA, New Zealand Transport Agency and Aurecon. Probably more instructive than the name on top of the letterhead of the covering letter of the actual brief. Looking at the performance proposed – the design proposes 115 bus movements per hour initially (one every 30 seconds), with 7500 people per hour by 2041. I wonder how that compares to another bus station option, eg the one drawn in diagram form above? I would love to know who came up with the idea of “reducing bus movements in the centre of the city” and why this is such a great plan. Is this concept present anywhere else in the major cities of NZ, let alone the world. The only way of doing this is by pushing public transport out of the city which really places a question mark over the whole justification for this bus exchange. You either have a central exchange with all the buses going to it – or you have some half pie solution like is being proposed with “super stops” around the city centre. These “super stops” are effectively smaller interchanges so the actual interchange function is being split over three sites which is a massive crock. “I wonder how that compares to another bus station option, eg the one drawn in diagram form above?” Well that one also has 16 bus platforms shown, so presumably the answer is pretty much the same. Operationally I see no major difference; the proposed one has 5-10 sec of extra reversing out, whereas the diagram one may mean that you have to go around the block to get to where you’re going because of its linear layout (note that there’s a one-way street bounding one side of the interchange). The idea of reducing the number of bus movements into the town is not to reduce the number of people going into town but to have them coming in on fewer buses. Some of our minor routes are not anywhere near capacity onboard, so previously you had a whole bunch of half-empty buses heading into town (and we know how people grizzle when they see a big bus using their tax/rates dollars and carrying only a handful of people). Yes, initially there are winners and losers because some people now don’t have one single bus to get them to where they want to go; they have to transfer (and that’s caused a bit of angst here). But that transfer never costs extra money here in Chch; the challenge is just making it convenient enough (e.g. by connecting to a main line that runs past every 5-10 minutes). We will continue to have a big demand for heading into town in Chch, but the quakes have also ensured that we will continue to have a number of suburban nodes that are pretty important too. E.g. yesterday my daughter went out with her friends; they took the bus to three different suburban shopping centres – never once needed to go into town because the 10-minute frequency Orbiter took them directly where they needed to go, and then they connected with another bus at the last place to get to her friend’s house in the outer ‘burbs (and all up it would have only cost them $2.50 for the day). The Auckland hub and spokes network is a very different one from the one being implemented in Christchurch. Auckland Transport have got a clue, unlike Ecan who are just finding ways to slash the amount of money spent on the network because the National Government arbitrarily chopped funding. The hubs in Auckland are 10 or more kilometres from Britomart and are generally transferring passengers to rail from the buses rather than being a bus to bus transfer. At that distance the speed of rail into the centre of town more than makes up for any inconvenience of waiting time. The number of services spoking out from each hub means they can be big well equipped facilities similar to our bus exchange.. Contrast that with Ecan’s model which puts the hubs, in several cases, only 2 km from the central city bus exchange. So for a trip of say 5-6 km that trip is now divided in half with an additional waiting time between the two legs waiting to transfer from one service to the other. The waiting facilities at the superstops are much inferior to what is offered at the central city exchange and you have to get off the bus to the stop and then get back on again when the bus turns up. And all this for a 5-6 km total trip. And then why aren’t all the route organised around hub and spoke? Simple, if this happened proper suburban interchanges would have to be built, instead of the superstops, the superstops are only viable if they are being used by only a small number of routes, which is actually the case. When you look at some of the spoke routes they are farcical because they actually duplicate the hub route by doubling back along it. it’s actually not a very efficient system at all. Transferring is the issue and that is because of the delays and inconvenience associated. In addition the frequency of services on many of the routes was slashed. It used to be the case if a route wasn’t performing Ecan would look at changing the route to go past more areas. There are a number of ways of addressing the number of buses on the road and the Ecan one was simply to slash the least performing routes by chopping them in half. I would guess because of the inconvenience, most of those routes are now carrying far fewer passengers. It is not a superior system that is going to build up traffic. I would expect my experience is typical, instead of using the inconvenient spoke routes I have changed to using other routes and walking a little further to the bus stop because the hub-spoke routes are so badly designed and inconvenient. The Orbiter is not a good example of how the new system works because it is an existing route that long predates Ecan’s hub-spoke system. 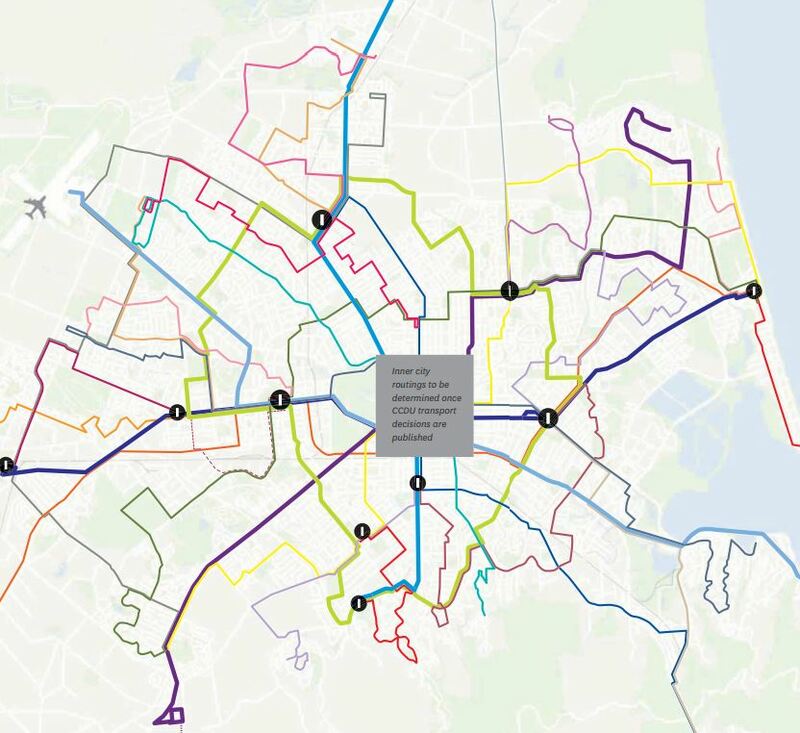 The places to put hubs if you were going to implement that type of system would be say Belfast and Hornby which are much further out than the 2 km joke hubs we have now, where buses can radiate out into some of the other areas like Rangiora, Woodend, Prebbleton, Lincoln etc and then say 10 km express service into the city centre. The City Council told Ecan at public consultation they did not agree with Ecan’s system and have stalled the superstop being built in Riccarton and are now calling for a public transport workshop to be held very soon. I think you are wrong about the “pedestrian crossing” to the centre island. The centre island looks to me that it will not be a public area. In the old exchange this was where the control centre was located, and used only by staff. How do passengers move between the platforms e.g. overhead walkways? They go up the stairs/escalators/lifts. The floor above has seating, ticket sales, arrival/departure boards, etc. Like a train station. I have duscussed this on the Chch EQ messageboard on TradeMe. It seems to me that the idea is not very popular. On the positive side after you get hit by a reversing bus and are lying on the tarmac you will be able to look up and see an NZ Institute of Architects award winning roof and appreciate function following form. Christchurch is perfect for a bunch of pendulum (through city) routes. 120 movements per hour could be handled on a couple of bus mall type streets with kerbside stops with suitable amenities. 30 movements per hour each way on each street. Let the place where these streets cross be the ‘central interchange’. Or if the size of the CBD or the amount of bus traffic wants more, have two north south and two east west trunk routes. Then you have four inner area interchange points, but note well, any particular rider on a through city transfer trip will only want to use one of them. There is no reason at all why these four interchanges need to be pulled together into one place maybe out of a misguided sense of neatness. Principle: buses should be on the street as close as possible to the action. Particularly to provide the activity and oversight that gives a sense of security at offpeak times. I can imagine this 100x100m offstreet site, visually dominated by 16 empty bus bays, being a very lonely and unpleasant place at night (and remember ‘night’ means about one third of the total hours of operation, so this is not a trivial issue). 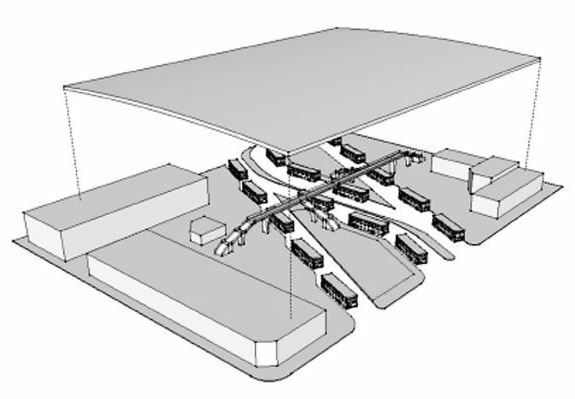 Principle: a bus interchange should have the smallest possible footprint consistent with handling the demand. To bring people closer to the surrounding area; to minimise the interchange walk between buses; to improve the sense of security at low use times; to improve the visual amenity – it’s simply not possible to make a pleasant waiting environment when it’s dominated by a vast area of hardstanding. With kerbside through bus stops, there is a tension between ‘one stopping point for many routes’ (concentrates the activity, but problems when three buses pull up at once), and separate stopping points in line (uses more kerbside & makes more demands on riders to find the right place to wait). But it’s easy to find the best compromise (‘routes A,B&C here, routes D,E&F 50m along’) without committing to a lot of inflexible infrastructure. If you get to the point where too many inline stops on one kerb spread out the interchange walk too much (‘routes G,H&I 100m along, routes J,K&L 150m along….’) you can move to ‘parallel kerbs’ like the Perth busport design that Anthony linked to. Principle: optimise your design for the *interpeak*. This is for the sake of minimising the footprint as noted above. Don’t build a Rolls-Royce design with 16 bus bays, knowing full well that 90 per cent of the time most spaces will only be used twice an hour. If you need more space for the peak period, let this be overflow space that doesn’t interfere with the compactness of your ‘fulltime’ structure. The Perth busport style suits this well too – extra kerbs can be brought into use in the peak period, but don’t get in the way too much at other times. [note 1]. And of course, using sawtooth bays for through routed buses is quite crazy. Key principle: reject the idea that ‘good interchange functionality’ needs to mean ‘large expensive off street structure’. People want facilities, not architecture – shelter, security, seating, information, toilet, coffee shop, bike storage, warmth in winter. All of these can be provided in little space at the kerbside. Maybe not literally on a 5m wide footpath, but it should be easy to incorporate them into adjacent buildings or into a bus mall with a narrowed carriageway. note 1: this works best if your overflow space is used by distinctly different peak only routes, rather than by extra frequency on fulltime routes. Otherwise you need fiddles like ‘Offpeak: routes A,B,C&D here. Peak only: routes A&B here, routes C&D over there’, which is admittedly not ideal for direction finding for the people who use routes C & D.
And another thing: the waiting place for a bus should be absolutely as close as possible to where the bus pulls up (like, within 5 metres), so that the arrival of a bus demands your attention. Otherwise you risk missing the bus if you put your head into a book [showing his age here], which is very stress-producing. It’s not clear how the proposed design handles this. And yet another thing: an interchange should give visual clues about direction to match people’s mental map of the city. On the street you have this: ‘this is east, that’s west, and as I’m going west I need to cross the road.’ In a terminal arrangement where opposite direction buses leave from identical looking bays, you don’t have those clues. PS Parramatta in Sydney is a good example of what I am thinking of. About 135 peak hour departures from 6 stopping points on the kerbside on a 150m stretch of narrow two way street (Argyle St on the south side of the station). NB the area on the north side of the station visible on google maps is used for layovers. I think you put the main waiting room above island platforms with stairs/lift down, People will wait there for longer waiting times and as their bus arrives they go down to the island platform, which has limited seating of its own. Similar to the concept image shown above. Another NZ public transport disaster waiting to happen. Is anyone surprised? Bumping up this thread…Since the Exchange is delayed, I went to have another peek around the site, and to add to the above comments, the Exchange does not allow any access on the bus roads as is completely cut off from the public. I think it actually looks like they are even putting in automatic gates on the bus entrances/exits though I won’t know for sure until it opens. I was going to make a guest post regarding the bus exchange and other Christchurch related things, but I had to put it off since I wanted to take some pictures of the new Exchange Building on the inside. I shouldn’t be too far off from opening.